Have you ever wanted to fly like a bird? Well, gliding is the closest you can get to realising that dream and we offer four ways for you to try it. 1. Half-day course consisting of 3 aerotow flights or an equivalent number of winch flights lasting a total of about one hour in the air. 2. Aerotow launch behind a light aircraft to over 2000’ for a flight lasting about 20 minutes. 3. Winch launch for a flight lasting about 5 minutes. Climbing steeply to about 1000 feet in 30 seconds. 4. “taster session” for groups. We can provide 10-15 of you with a flight on a Wednesday evening in the summer months. To promote and encourage in those of all ages, a practical interest in gliding and to provide an opportunity to participate in this exhilarating and satisfying sport. To promote and encourage participation in gliding, by junior, local community and student members. 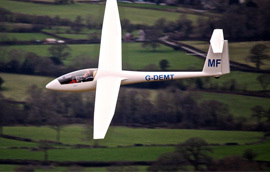 To provide an opportunity for qualified glider pilots of all standards to improve their experience and skills, under the guidance of highly experienced instructors and competition pilots. To foster an environment that encourages teamwork, mutual support and co-operation among its members. To promote a positive public image and to work in harmony with the local community and authorities to provide a leisure facility that will be of benefit to all local residents. 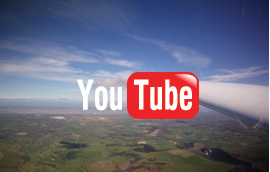 Above all, to provide the safest and most enjoyable gliding and flying opportunities.